Though I’m not the biggest fan of most hopped ciders, I respect Anthem Hops for doing its thing. If you’re the kind of person who generally likes hopped ciders, or who thinks an apple-y lager sounds tasty, I feel pretty confident in recommending this one to you. I hesitate to recommend some hopped ciders to beer drinkers because apple and hops seems like a combination that might not appeal to many (despite “appeal to beer drinkers” usually being the reason for hopping a cider in the first place), but this is one I feel pretty good about. The Cascade hops give the cider a, well, hoppy aroma, but also with a side of fruit and florals. It’s quite dry, a little tart, a very pale straw color, and the hops are well evident in the bitter, somewhat funky taste — but they don’t fight with the apples, instead blending together into a cohesive whole. Interesting thing about Anthem: they have a page where you can see specific percentages on what recent individual batches of each of their products contain — for example, I’m probably drinking Batch 52 of the Hops, which is 40% Red Delicious, 28% Granny Smith, 5% Golden Delicious, and 26% assorted others. Another interesting thing about Anthem: the batch info is especially relevant (though it would be even more relevant if it included ABV) because their product line stays the same, but with varying composition over the course of the year based on what fruit varieties are available. You can see in the case of their main cider that even from one batch to the next, the composition can change significantly. Anthem’s site says the Hops ranges from 5.0%-6.9% ABV, and my local liquor store had this tap at the growler station listed at 6.9%, but I don’t know if they’re just listing it at the high end of the range to be cautious or if that’s actually the ABV of this batch in particular. Posted in Cider. Tagged anthem cider, hopped ciders, hops. When stopping by a grocery store I don’t usually visit to grab a bottle of wine for a housewarming party, I stumbled across two bottles of Spur & Vine all by their lonesome, and thankfully there weren’t too many people around to hear my ensuing noise of delight. They were even the 650mL bottles I remembered from Cider Summit Seattle last fall. Unlike The Original, Spur & Vine holds up to my memories — this is such an interesting and delicious cider. The whole reason I’ve become such an avid cider drinker is because I dislike the yeasty, hoppy, bitter taste of every beer I’ve ever met (all of them, yes, probably that one you’re thinking of too), but because of the dry-hopping process Square Mile uses, the cider doesn’t come out tasting particularly of hops at all. Instead, it’s gained a lovely floral aroma and a citrusy, slighty fruity taste, sweet enough that I wouldn’t describe it as dry, but with earthiness and a little tartness to balance it out. 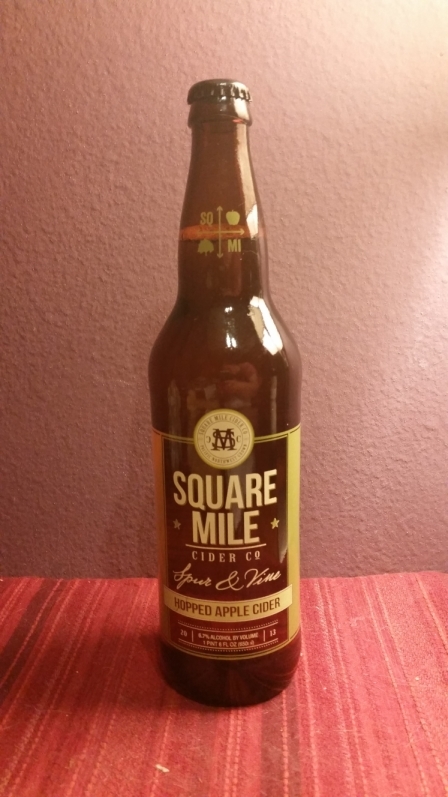 Square Mile’s website says they add Galaxy hops to the same apples used for The Original (Red Delicious, Yellow Delicious, and Jonagold), but if I hadn’t read that, I would have thought there were some bittersweet apples in the mix. All in all, a memorable cider and one I wish I could get my hands on more often — though now that I’ve found a store that carries it, perhaps I can. Spur & Vine is a light, clear yellow, with a floral aroma and low fizz. It’s 6.7% ABV and can be purchased in 12oz or 22oz bottles. Posted in Cider. Tagged hopped ciders, spur and vine, square mile cider. 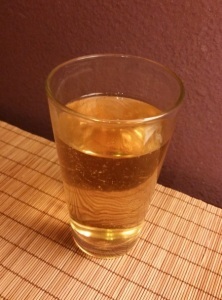 Due to some, hmm, shall we say misunderstandings regarding the recent Washington state privatization of alcohol sales and the classification of cider under state laws, this is the first cider my local liquor store has been able to offer on tap at their growler refill station in many months. 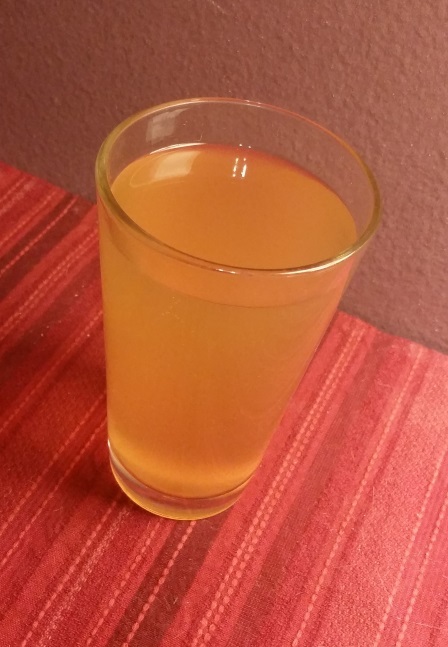 Grizzly Ciderworks’ The Ridge is a solid dry cider that doesn’t mess around. It gets in your mouth full of firm woody bitterness, accompanied by a healthy complement of green tartness and acidity, and then moves on with a finish that barely lasts. 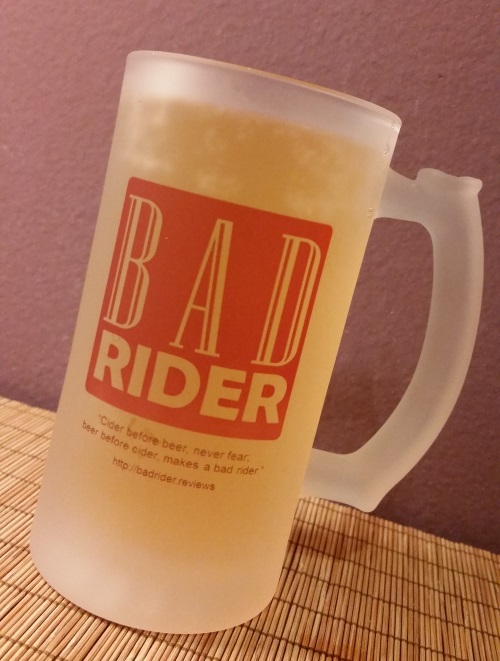 I do recommend you keep this one cool as you’re drinking it, as there’s a certain amount of earthy funkiness that starts to emerge in the taste as it warms up — unless you enjoy that sort of thing, of course. Fresh from the growler, it smells strongly of yeast, but that fades into a light aroma of apples gone just off, like they’ve dropped from the tree and spent some time on the ground but are still fine to use. 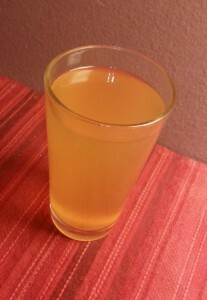 The Ridge is a cloudy light amber color, medium fizz, 6.7% ABV. I got my hands on it at the growler station at my local liquor store and from what I can gather it’s only offered on tap in various locations, not bottled. Find some for yourself here! Posted in Cider. Tagged grizzly ciderworks, hopped ciders, the ridge.